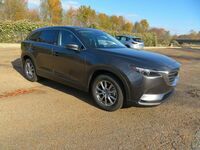 The latest version of the Mazda CX-9 to arrive at the Gwatney Mazda of Germantown showroom has picked up several improvements for the new model year. Not only do these upgrades reassert the three-row crossover SUV’s position as the top-of-the-line Mazda crossover SUV, but it’s able to punch above its weight and challenge more expensive competitors. A comparison of the 2019 Mazda CX-9 vs. 2019 Acura MDX is a clear illustration of just how capable the new Mazda crossover has truly become. Potential buyers of the new Mazda CX-9 will see several important advantages over owners of the Acura MDX. 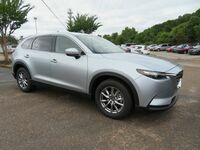 The new 2019 Mazda CX-9 is currently available at the Gwatney Mazda of Germantown showroom. Customers can schedule a test drive today by calling, 833-241-6312. In all fairness, Acura makes some very good crossover SUVs. 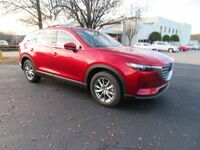 However, when visitors of the Gwatney Mazda of Germantown showroom take a look at the 2019 Mazda CX-9, they will be getting more vehicle for the money compared to the 2019 Acura MDX. The chief difference between the two crossover SUVs is how much interior volume is available. Potential owners of the 2019 Mazda CX-9 have three rows of seating available that can accommodate up to seven passengers. Acura MDX owners will only have two rows of seats with a maximum seating capacity of five passengers. When properly configured, the 2019 Mazda CX-9 can make up to 71.2 cubic-feet of cargo volume available. Acura MDX owners will fall short of that mark at 68.4 cubic-feet. 71.2 cu.-ft. Max. Cargo Volume 68.4 cu.-ft.
3,500 lbs. Towing 3,500 lbs. 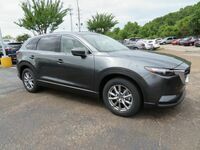 All versions of the 2019 Mazda CX-9 available in the Gwatney Mazda of Germantown showroom use the same engine and transmission combination. Under the hood of the three-row crossover SUV is a turbocharged version of the SKYACTIV®-G 2.5-liter, four-cylinder engine that is attached to SKYACTIV®-Drive six-speed automatic transmission featuring manual-shift and Sport Mode. It will produce 227 horsepower with a regular grade gasoline, but premium grade fuel can yield up to 250 horsepower. Regardless of choice, the 2019 Mazda CX-9 will make 310 pound-feet of torque and offers a maximum towing capacity of 3,500 pounds. The 2019 MDX uses a V-6 engine and it makes a bit more power than the Mazda CX-9. However, unless an Acura customer chooses the top-of-the-line trim of the 2019 MDX, it will feature the same towing capacity as the new Mazda CX-9 – negating any practical performance advantages.